One of the tasks of fiction—one of its ambitions, one of its motives for speaking up, one of its desires—is to turn the ordinary into the extraordinary, by harnessing adeptly the power of story, of context, of point of view. Most of us take our motor ability for granted (and how should we not? ), but don’t we leave our easy security behind when we read an accurate report of the mind of a person who is disabled? Here, for instance, is a moment in the life of Saeed, the crippled young protagonist of Desire by Any Other Name, one of the stories of Nighat M. Gandhi’s mature and considered debut collection, Ghalib at Dusk. Saeed clearly feels desire, discontent, longing, not just when he sees a female body, but when he sees any normal body, and Gandhi’s story, in wheeling him in and out of this encounter that he will always cherish, also wheels us into a place of perception and understanding that we would otherwise have small chance of reaching. Disability, with its connotations of loneliness, alienation, need, is one of the overriding themes of Gandhi’s book, but so, on the other hand, is domesticity—the comforts and challenges of living together, of keeping love or regard going, of dealing with adulterous desire. Her stories achieve a number of surprising effects as they shuttle between these two poles. The title story, for instance, deals with the experience of a married woman in Allahabad on a casual visit to the household of Babar bhai, an elderly neighbour who is an expert on the poetry of Ghalib. 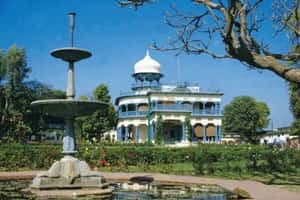 Unusually for a South Asian writer, Gandhi has lived in Bangladesh, Pakistan and India; half of the stories in her book are set in Karachi, and the other half in Allahabad, where she now lives. But it seemed to me that a sense of place, a relationship to place, is not so important to her characters as a sense of home is: the actual houses and rooms they inhabit and share with others. Her story Trains, for instance, is about a woman, Urmila, the sacredness of whose home has been violated by her husband’s affair with a servant, but who nevertheless clings to that very house as the stable centre of her power, pride and respect. Many of Gandhi’s other stories bestow a similarly lucent attention to the meanings of domestic space, and in doing so they turn these small worlds into places we can all enter.